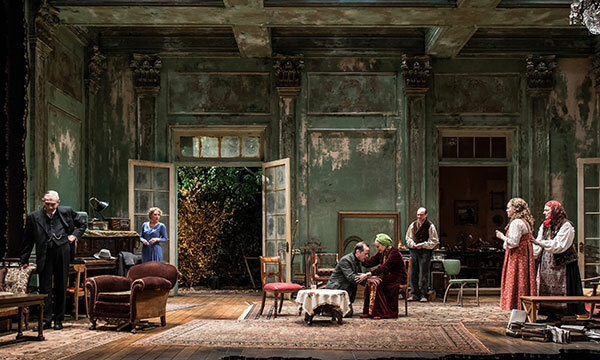 Goodman Theatre presents UNCLE VANYA. Scenic Designer Todd Rosenthal solidly sets the tone of past grandeur. His estate has well-worn elegance. The walls have a weathered appearance, yet, they create a solid fortress. The height suggesting old money contrasts dramatically with the mismatched furniture. With or without the ensemble, this room is bursting with character. Rosenthal has built the perfect room to illustrate a family stuck in their past and present financial woes. 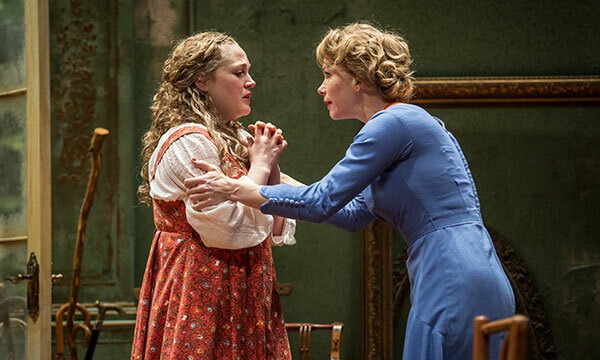 Director Robert Falls skillfully stages Annie Baker’s adaptation of Anton Chekhov’s classic. Falls paces it with a deliberation. He doesn’t rush it. Falls captures the unhappiness born out of the mundane. His characters listlessly perch on furniture. There is a feeling of waiting for something to happen, for love to conquer all. When it doesn’t, Falls forces us to feel the return to the extraordinary ordinary. The last twenty minutes of goodbyes and confirmations of the departures is painstakingly laborious. We watch Tim Hopper (Vanya) and Caroline Neff (Sonya) return to bookkeeping servitude. The reality is disquieting and frustrating. Fall’s unhurried navigation also gives the one liners room to stand-out. Both the deliciously melodramatic Marilyn Dodds Frank (Maria) and the hilariously straight talking Mary Ann Thebus (Marina) showcase their comedy timing with well-placed comments. Falls orchestrates plenty of humor into this otherwise melancholy Chekhov masterpiece. When the bewitching Kristen Bush’s (Yelena) presence upsets the household’s routine, Hopper both gushes and laments openly about his love for her. Hopper amuses in his school-boy-crush-trance or his unraveled hysterics depending on the moment. In contrast, Marton Csokas (Astrov) maintains his romantic allure even in his drunken shenanigans. Both Bush and Neff fall victim to his magnetism. While he and Bush give off a steamy heat, he barely acknowledges the earnest Neff’s existence. Playing the scholarly patriarch, David Darlow’s (Serebryakov) obtuse remarks sting and zing. Darlow carries himself with an air of unearned admiration making his presence even more comical. Although I would have personally liked 15-20 minutes shaved off, this adaptation of UNCLE VANYA keeps it real. Falls makes sure we feel the hopeless despair of being stuck in a routine, in a family, and in a house that used to be so much more than it is now. And he ensures our visit to UNCLE VANYA’s is engaging. The room is bursting with characters! 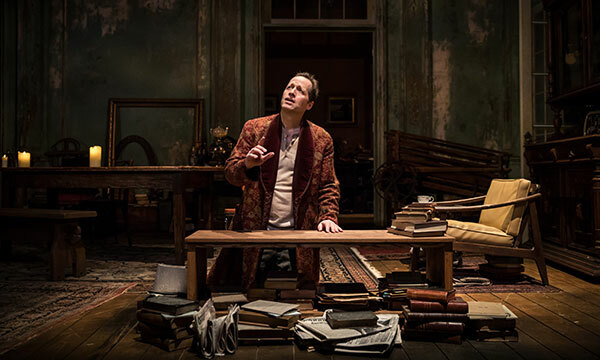 Tickets are available at GoodmanTheatre.org/UncleVanya, the box office (170 North Dearborn) or by phone at 312.443.3800.